Headline-Civil War in Syria in the last two years increasingly attracted the attention of the international community, especially a superpower like the United States. Washington apparently not only concerned about the arbitrariness of the Baathist regime of President Bashar Al Assad, but also began to suspect Damascus using chemical weapons crush rebel forces, backed by the U.S. and other countries. President Barack Obama said "the game will be changed" if the Assad regime actually use weapons of mass destruction. The U.S. initially cast only condemnation and running diplomatic lobbying in the UN Security Council, but now it wants to engage further in the Syrian conflict. Until now there has been no statement sent military personnel. The American public was, in a popular poll, would not support such an option. However, sources from the military and defense officials in Washington, the U.S. media expressed their government prepares to send weapons to help the rebel forces in Syria. Obama and the officials have repeatedly expressed his dislike of the Assad government and the Baath regime and hoped they were eliminated from the power stage. However, for alleged possession of chemical weapons, the U.S. this time to respond carefully, and seemed to not want to repeat the mistakes of the war in Iraq in 2003, which allegedly had weapons of mass destruction, but there is no strong evidence after the U.S. military invaded the country all-out that. The war in Iraq, and also Afghanistan, at a cost of trillions of dollars is very expensive for the U.S. policy. Moreover, Uncle Sam is now undergoing a budget crisis, everything must be saved. In a press conference in Washington DC on Tuesday night, Obama said there was information Syrians used chemical weapons. However, this information, which is referred to as "physiological evidence," is believed to have a solid case and are still many details that are yet unknown U.S. intelligence agencies. If there had chemical weapons were fired, who did it? Assad regime or the rebels? "We do not know how [the weapons] are used, when it is used, and who uses," Obama said, as quoted by Reuters news agency. He said it has not had a series of concrete evidence reinforces the suspicion, and explain what is really happening in Syria. Obama did not rule adalanya explain all the action from Washington - whether it be military or other-for the Assad government. However, he insisted the U.S. would not rush to intervene more in Syria. In the U.S. media, Obama's statement gave rise to the judgment that, despite last week that had no sign of Syrian government forces using sarin gas "for a small scale," Washington was not immediately act without judgment completely accurate. Obama still needs more accurate information about the issue of the use of chemical weapons in Syria before taking further action. Spokesman for the U.S. Office of the President (White House), Jay Carney, on Monday said that so far there is no deadline to give the final decision whether there is the use of chemical weapons in Syria, and who is using. U.S. officials have candidly explained "physiological evidence" as to what shows Syrian troops using sarin. However, U.S. government sources said that the evidence was in the form of blood samples from a number of alleged victims, and also from soil samples. "From the situation that I'm pretty sure the intelligence community assessed that there were people exposed to sarin, and it was based on a sample of physical and chemical analysis of the blood of the victims," ​​said Gary Samore, an observer from Harvard University, as quoted by Reuters. He is a former advisor to President Obama on nonproliferation of weapons of mass destruction. According Samore, it seems there is a "question mark" over whether the chemical weapons used by rebel forces or the result of "command officials in Damascus." Rebel groups in Syria have always accused the Assad government used chemical weapons destroy people's revolt. In contrast, the Syrian government itself has denied using chemical weapons. If there is the use of such weapons, the culprit is definitely the rebel forces or terrorist groups, as happened in the city of Idlib. The claim was made Ambassador of Syria to the UN, Bashar Jaafari, told the news station Al Jazeera. However, until now the Syrian government refused to give permission to the experts from the United Nations for their country in order to investigate whether there has been a use of chemical weapons. Government only if the UN gave permission only examine suspicions of the opposition. Since erupted in 2011, the Civil War in Syria has killed 70,000 people and left 1.2 million people were refugees. For some observers, the conflict stems from most people's dissatisfaction with the Baath regime which has 40 years in power, but others argue this is the outbreak of the "Arab Revolution"-which succeeded in overthrowing the old rulers in Tunisia and Egypt. Although often criticized the regime in Syria, President Obama many times reluctantly decided further U.S. involvement in the Arab countries. 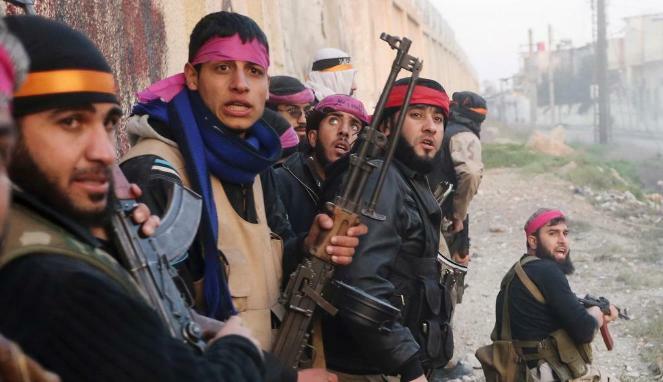 U.S. involvement has been only in the form of non-weapons aid to the Syrian opposition forces. U.S. troops option seems still far from serious consideration. This attitude is understandable considering the majority of the American public is now no longer wants to have friends, relatives, and their families were sent as soldiers to foreign countries for actual conflict had nothing to do with internal security threats. The point is, Americans do not want no more tragedy "Vietnam War." Public reaction was reflected in a poll compiled by two leading U.S. media, the New York Times and CBS News. Announced Tuesday, the survey revealed 62 percent of Americans believe their country has no responsibility whatsoever to act on civil war in Syria. Only 39 percent of respondents who claimed to participate intensively following the violence in Syria. Attitude of this poll indicate conflict in Syria is not a major concern of Americans. Although still not considering sending troops to Syria, Obama reportedly has prepared a shipment of weapons to opposition groups in Syria. If realized, this is a most U.S. involvement in the crisis. Officials, as quoted by The Washington Post, said the idea of ​​delivery of weapons has become the discussion and become a new alternative in addition to political negotiations. Although not speaking clearly over arms shipment plans, Obama told reporters said "there are a number of options to be considered very carefully" when there is certainty Assad government used chemical weapons against his own people are rebelling. A senior official said that they had talked about the help that has "direct military purpose." U.S. officials are not willing to specify what kind of weapons would be sent, but the rebels in Syria have requested anti-tank guns and surface to air missiles. The United States and its allies have reportedly also sent instructors to neighboring Syria, Jordan. There, they train local soldiers and rebel forces to anticipate the threat of chemical weapons.